Heres some hotness from Kanye West & Louis Vuitton. For once I’m really falling for these Louis Vuitton kicks and with Kanye’s extra touch on them I think its about time for me to get a pair. 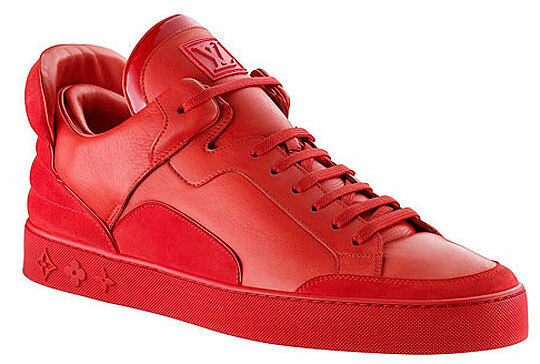 What are your thoughts on the Kanye West & Louis Vuitton sneaker? PARIS — Marc Jacobs and the Louis Vuitton men’s studio director Paul Helbers have some design competition this season. 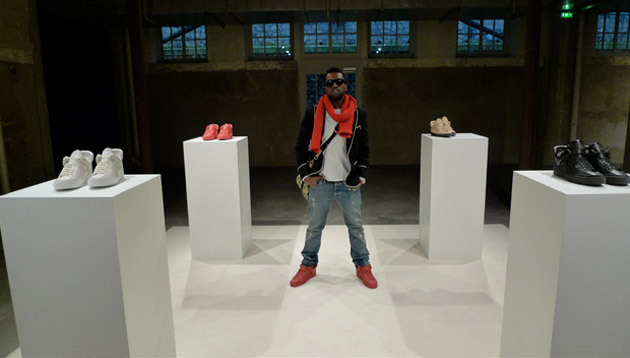 Kanye West, who was sitting front row at the Vuitton show, has designed a line of five LV sneakers. Only one design, above, was featured in the show — a monochromatic midtop with no frills, save for a quilted flap in the back, all the easier to tuck pants into. “The inspiration came from a jacket with a huge collar in the movie ‘Dune,’ ” West says. “Most sneakers focus on the tongue, so I wanted to do something different.” West knows whereof he speaks: he says he has no idea how many shoes he owns, but he does know that he routinely needs to send shipments off to storage. The LV-meets-Kanye kicks will be available at Louis Vuitton stores in June.